When Max trips his way into Serena's life, she can’t help but fall for his awkward ways – until she discovers who Max really is. Will Serena share her secret or run? To ask other readers questions about That Secret You Keep, please sign up. So may questions to be asked and answered! Will Max continue in the pursuit of his birth parents? Does Max's Dad, Peter ( the doctor) know who is Max' s birth mother? Will Serena be there to support Max in his quest? Absolutely, we need a sequel! Do you think there will be a sequel? A sweet and tender debut by author Brenda Benny. Follow awkward, gangly bassist Max and quietly grieving singer Serena stumbling their way through first love while trying to overcome and deal with heartfelt subjects such as loss, trauma, secrets, adoption, sexuality and self-discovery. I loved the music-themed background, all those amazing father figures and Benny's light way of tackling rather serious subject matters with that beautiful voice of hers. We can let our secrets define us, cage us, or peck away at us, bit by bit. But if we can admit them, even to ourselves, we might spread our wings and take flight: it can set us free. I did struggle a little with the first half of the book, though, due to its slow pace and lack of tension. However, as soon as the first conflicts started to arise, I was all in. This definitely deserves a lot more attention. New year, new review format. Due to having much more on my plate, I'm going to write shorter and more informal reviews in order to keep up. whatever group that may be. I guess we all want to be chosen by someone." This was a New year, new review format. Due to having much more on my plate, I'm going to write shorter and more informal reviews in order to keep up. This was a precious, Canadian, YA romance that maintained its happy-go-lucky vibe while handles serious themes. Think Stephanie Perkins meets Becky Albertalli. I always love starting the new year on a good note and this did not disappoint. It was just so cutesy. And now for a more serious note; the loved how this book explored Max's relationship with his dads and his openly gay best friend Hayden. While Serena and Max's budding romance was definitely a headliner in this, the relationships that really shined for me were the platonic ones. This was such a cute book. The music background of the book was fantastic and brenda made sure that it was one of the main focuses and not let it fade into the back ground. I liked how we were in the point of views of both our main characters, max and serena. Max was such a caring character, he has strong partnerships with all the characters around him like his best friend and his fathers and he tries his best to express his feelings. Serena is a strong female character despite fighting a huge b This was such a cute book. The music background of the book was fantastic and brenda made sure that it was one of the main focuses and not let it fade into the back ground. I liked how we were in the point of views of both our main characters, max and serena. Max was such a caring character, he has strong partnerships with all the characters around him like his best friend and his fathers and he tries his best to express his feelings. Serena is a strong female character despite fighting a huge battle herself and doesnt let her true feelings show. The relationship between the two characters was so cte and they cared for each other so much which made me physically smile while reading the book. "It occurs to me that our worst secrets - the ones that we most fear revealing to others - sometimes cause no more than a small ripple on the ocean when we think a tsunami will follow." Max and Serena are the kind of couple you wish you were a part of. They care about each other deeply, and fight through layers of pain and secrets to open up their hearts. Though their story is sweet, it is far from an easy road. Serena is still raw from the death of her mother, and Max is struggling to explain his sexuality to his dads. These secrets build walls around the two, making 'That Secret You Keep' an unpredictable and fresh take on a teenage romance novel. Over the I LOVED THIS BOOK!!! Over the course of the novel Serena goes through the many stages of grief, from blaming herself for her mother's death to finally accepting that it is not her fault. Watching Max guide her through this tough time is both sweet and beautiful. The pain Serena feels is authentic and candid, causing the reader to feel a deep empathy and emotional connection with her. That Secret You Keep was a wonderful debut by Brenda Benny. The story explores the aftermath of loss, and the struggle to keep going when you just want to give up. Max is a tall, gangly double bass player who has secretly pined for the same girl for years; Serena is a girl torn apart by loss, wondering how to go on. When events cause Max and Serena to come together, they must decide if their secrets will tear them apart or if they can overcome them together. Oh wow! What a great story. It’s been awhile since I’ve read a young adult novel. This is a story about a young man that was adopted by 2 men. And his best friend was also raised by 2 men. So rumors had been spread that Max and Hayden were together. But Max was straight and had a huge crush on Serena. Serena experienced a very traumatic car accident last year where she lost her mother. She blames herself and feels so guilty. This is a story of secrets. Everyone has secrets. But you can’t let your secrets take over your life. And both Max and Serena find that out as they find love for each other. Thanks to NetGalley and the author for a free review copy of That Secret You Keep! "Love is love, no matter who it's between, or how it happens--we all have similar experiences." Holy moly this book is cute! I was really wowed by the incredibly diverse cast of characters and all the friendships and relationships going on. That Secret You Keep is a very well written book with multiple powerful messages about everything from sexuality to friendships to mental illness to grief. All of th 3.5 stars. All of the characters in this novel are believable and so fleshed out; even the minor character like Emily, or like Malik, who I think only had a handful of lines in this book. But even he was REAL and THERE, if you get me. And, get this, a bitchy redhead character but NO GIRL HATING. Oh, thank you Brenda Benny, my mind has been blessed by the words you have written. You give me faith! Honestly, Serena and Vanessa's friendship and their struggles and rebuilding was a highlight for me! Same with Hayden and Max; seeing them grow up over the course of the book and develop what seems an even stronger bond and friendship--despite certain differences--was a really nice touch to the story. The only reason why I rated this novel low while raving about it at the same time is that I just didn't connect with the characters personally, or really share any of their dilemmas. I have never questioned my sexuality and (thankfully) have never lost a loved one so close as Serena did. So while I deeply appreciate this book and all it conveys, it just didn't hit me as hard as it probably would for many others. I definitely recommend that everyone check out this book by this brilliant author, Brenda Benny. I am looking forward to reading more from her in the future! (P.S. Just gotta pop this quote in here real quick because it is HIGHLY IMPORTANT.
" 'Although your symptoms may have improved, I'm wondering if Don might be serving as a distraction from the real issue here,' he muses. " I was very pleasantly surprised by That Secret You Keep, by Brenda Benny. After a bit of a slow start, I was pulled in by the budding romance between the characters and their lives. Max has had feelings for Serena since the first time he saw her at their arts high school. Adopted and raised by his dads, Max is kind, sensitive, polite and open-minded. He can’t bring himself to speak to Serena until he runs into her at a Halloween party and is able to use his costume as inspiration. After another chance meeting at a coffeehouse, he asks her out for coffee and she accepts. Max delights in getting to know her and making her smile. Serena hasn’t been herself since losing her mother during their junior year. Both of them have secrets they’re keeping, and secrets have a way of coming out. I liked Max and Serena very much. I thought Benny did a great job with their voices and characterizations. Their story felt real and relevant to today’s world, not to mention poignant. There were times, especially at the beginning, where being inside Max’s head in particular felt very stream-of-consciousness. For me it felt wordy, obscuring the more important thoughts with inconsequential noise. I enjoyed the musical references, and it was a great way for them to find common ground. I had mixed feelings about Hayden, Max’s best friend, as well as Vanessa, the leader of Serena’s group of friends. The reader doesn’t really get to know the rest of the group, but I found Serena gave Vanessa the benefit of the doubt far too often and abundantly. Vanessa often didn’t seem genuinely sincere and deserving of Serena’s faith. As for Hayden, even though I often understood where he was coming from, he didn’t seem to treat anyone nicely, especially Max. I wish I’d been able to see more of what had made their relationship so strong and resilient. To me it felt like Max just put up with Hayden’s shortcomings, making their relationship lack the balance of a good, strong friendship. There were some interesting twists and turns that I didn’t see coming, which added to the overall enjoyment of the book. The writing in the second half of the book really showcased Benny’s talent, and I’ll be looking for more of her books in the future. That Secret You Keep by Brenda Benny is a contemporary romance novel I got from NetGalley. Okay, I admit that this was a cover pick because it’s so prettyyyyy and aesthetic y’all. I was really expecting a lot here since it looks so promising. The book is about Maxwell and Serena. Maxwell is the only adopted son of his fathers. Yes, fathers. His dads are gay and they’re so adorable. Serena just got out of a car accident which killed her mom and now only lives with her dad and goes to therapy. It’s the struggle between the two of them as they both tried to understand and get to know each other better. I actually enjoyed reading the first parts of the book because Maxwell belongs in a jazz band while Serena is a great singer. They study in a school wherein creative talents are honed. I just watched Whiplash before reading this. It’s a movie about a young drummer who studies in one of the greatest music schools and just got in the studio band. I actually enjoyed jazz because of the movie and I was kind of imagining that I can hear the pieces whenever I read this book and it’s time for them to play or rehearse. It was really easy to read, although it took me almost a week because of my busy schedule. I kind of felt that Serena was too awkward and I didn’t feel any connection between her and Maxwell from the start. I just started to ship them (but not really) or maybe in favor of them during the last few chapters of the book. The story is actually good if I were to look at it as a whole but some details just doesn’t seem to fit together. The plot twists were great and really were surprising. What I loved the most about the book is the spotlight in the LGBTQ+. Max’s parents are gay. He’s got a gay friend who also has a gay dad with a boyfriend. Also, the book doesn’t just focus in romance but also family and friendship. Overall, I rate That Secret You Keep by Brenda Benny, 3 out of 5 stars. **I have received this book via NetGalley in exchange for an honest review. Ebook provided by NetGalley for review. Thank you. A really sweet book that flowed nicely and had likeable main characters. It tells the story of shy Max and his long term crush on Serena who is consumed with grief and guilt following the death of her mother in a car accident. A big hurdle to their relationship is Max's general inexperience around girls thanks to 2 dads and a gay best friend with whom he used to be very close - a point I wish could have been explored further - however their relati Ebook provided by NetGalley for review. Thank you. A big hurdle to their relationship is Max's general inexperience around girls thanks to 2 dads and a gay best friend with whom he used to be very close - a point I wish could have been explored further - however their relationship developed steadily and was overall very sweet. I wish we could have learnt more about Hayden and Vanessa, in general the backing characters could have used some more fleshing out. Also we had Max debating whether he was actually straight - thanks to his dads and his past with Hayden - but I think Brenda missed an opportunity here to make him bisexual. We need more bi characters in fiction and bi men in particular get a bad rap but I can also understand not wanting to be too controversial with a debut novel. All in all I quite liked the book but it was just missing that spark to make it a 5. A lot of the YA books I've read (or started and just couldn't finish) recently have disappointed me, but this one did not. That Secret You Keep is the story of Max, an adopted boy with two dads, and Serena, a girl whose mom died in a car crash. There are obstacles to their love story, but the story manages to stay sweet and charming. There were a few little details that bothered me, but overall, That Secret You Keep was an enjoyable read. That Secret You Keep was a fabulous YA title. Issues that I could see teens having in common, all woven together with the pressure & simplicity of high school. Max & Serena were complex characters, with their own trials, that came together beautifully, loved how it was written. The supporting characters were just the right amount of detail, especially with the surprise mini dramas. Wonderful. To find that the title was Brenda Bunny’s first YA & self published was a treat, I expect to That Secret You Keep was a fabulous YA title. Issues that I could see teens having in common, all woven together with the pressure & simplicity of high school. Max & Serena were complex characters, with their own trials, that came together beautifully, loved how it was written. The supporting characters were just the right amount of detail, especially with the surprise mini dramas. Wonderful. To find that the title was Brenda Bunny’s first YA & self published was a treat, I expect to read more greatness from her! I give a lot of books to my nieces and nephews and I admit, sometimes I give them what I know THEY want to read and other times books that I want them to read and like. In this case, That Secret You Keep is both. I know my eldest niece will gobble it down, then pass it on to her friends. Serena and Max have their own unique take on the world and their observations and experiences make for a fun read that is fast-paced, but also slows down enough to be sweet and tender, just when you need it. Now I give a lot of books to my nieces and nephews and I admit, sometimes I give them what I know THEY want to read and other times books that I want them to read and like. In this case, That Secret You Keep is both. I know my eldest niece will gobble it down, then pass it on to her friends. Serena and Max have their own unique take on the world and their observations and experiences make for a fun read that is fast-paced, but also slows down enough to be sweet and tender, just when you need it. 3.57 stars I really enjoyed this book. It is about a boy growing up with two dads, and a best friend who is gay. He falls for a girl but she does not know he exists, all his friends at school this k he is dating his best friend. I loved the friendship with his best friend the ups and downs. Nice fluffy romance with some not so fluffy moments. Once I started reading this book, I was hooked. I became completely invested in the lives of Max and Serena, and couldn't wait to find out what would happen. 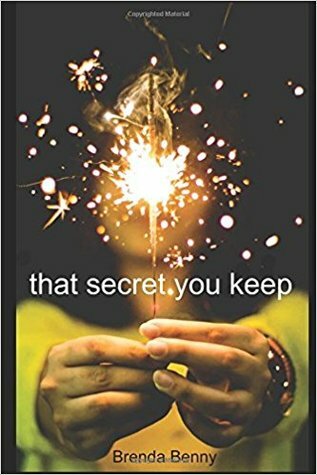 'That Secret You Keep' is a realistic young adult novel that expertly takes the reader on a journey of the challenges of being a teenager. The author writes about difficulty issues such as death and dying with empathy and realism. I loved this book and I can't wait for Brenda Benny's next novel! Bearing in mind that I'm not the target audience, I can't say this is a terrible read. However, I do read a lot of YA fiction, and this was not something that's going to stand out in my mind for years to come. It all seemed a little too "much ado about nothing" for my taste. I like the two main characters, but I would have liked to see them fleshed out a bit more, with some bigger obstacles. I read this in one sitting. I thoroughly enjoyed both Max and Serena as fully fleshed characters. The romance that grew between them wasn't rushed and wasn't without its complications. I don't want to spoil too much of the pot, but the issues of grief, identity and how secrets can hold you back from healing are brought in the story. I would definitely recommended this book. I adored this book! Read it in three days! Even got up in the middle of the night to read on! The endearing character of Max, in particular, kept me turning those pages, as did the scenes of teen angst played out at a Vancouver music school. Bravo, Brenda Benny! Just received my copy of your second book, "All the Promises We Break." Looking forward to cracking it open! I found this to be an enjoyable read with very diverse read. Max is a musician, and was adopted by a gay couple. Serena is grieving the death of her mom and trying to find her place back in the world. Together they death with love, self-discovering, and learning that some secrets need to be shared in order to heal. Overall, I enjoyed the diverse cast, and complex story line, would highly recommend for young adults. Thank you Netgalley for the chance to read this. I really enjoyed this book. Like other said, the first half was sort of slow, but I stuck with it and it paid off. Seeing as I love music, this was basically the book for me. I cannot wait to see what else the author writes. Max is seventeen, taller than everyone else, and trying to keep a few secrets from his dads. Like the fact that he wants to seek out his biological parents. And he’s not gay. But sometimes it’s easier to just keep secrets…secret. Like his longtime crush on Serena. Serena was a shining star at their performing arts high school, until her famous mother died tragically. Now she sits in the back of the chorus, wrestling with her debilitating anxiety and panic attacks, avoiding the spotlight. But together, Max and Serena find both happiness and understanding. They can tell each other anything. Except the one secret Serena has kept from Max, a secret that might tear them apart. I really enjoyed That Secret You Keep. Max is awkward and adorable, and his struggles are so realistically portrayed. Serena is deeply scarred from her loss and doesn’t think she’ll ever get better, but in Max she finds hope. A wonderful story of healing and love. I loved this young adult novel. The characters jump off the pages and the descriptive narrative engages the reader. I'm eager to read sequel. Love, Love, Love this book! Max, adopted as a baby and raised by his two gay dads, has admired Serena from afar since 9th grade. She barely knows he exists and is reeling from the recent loss of her mother. Max and Serena face so many challenges to starting and continuing their romance: her intense grief, his suspected homosexuality, their unknown "connection" that Serena keeps a secret. "That Secret You Keep" is a fresh take on YA Romance that was a real-page turner: I finished it in one day! As Love, Love, Love this book! Max, adopted as a baby and raised by his two gay dads, has admired Serena from afar since 9th grade. She barely knows he exists and is reeling from the recent loss of her mother. Max and Serena face so many challenges to starting and continuing their romance: her intense grief, his suspected homosexuality, their unknown "connection" that Serena keeps a secret. "That Secret You Keep" is a fresh take on YA Romance that was a real-page turner: I finished it in one day! This one was a fast and enjoyable read. It has some great representation of gay and bisexual as well as POC characters although I wish this diversity would have included more women. The author treated some rather serious topics in a light way, which perfectly fit with the overall tone of the book. While I didn’t quite connect with the main characters Max and Serena, I liked getting to know more bits and pieces of the side characters. There were a few things left open so they’ll hopefully be answ This one was a fast and enjoyable read. It has some great representation of gay and bisexual as well as POC characters although I wish this diversity would have included more women. The author treated some rather serious topics in a light way, which perfectly fit with the overall tone of the book. While I didn’t quite connect with the main characters Max and Serena, I liked getting to know more bits and pieces of the side characters. There were a few things left open so they’ll hopefully be answered in a sequel, otherwise I’d be quite disappointed with all my open questions towards the end. Thanks to NetGalley for providing me a free copy of this book in exchange for an honest review. NetGalley in no ways influences my opinion/review of this book. Going into this book, I didn't really know what it was about. I obviously had read the blurb before requesting the book, but by the time I started, I had forgotten the blurb. Within the first two chapters of this book, I was hooked. I see so many aspects of my current self in Serena and to see her evolve was comforting, and reassured me th Thanks to NetGalley for providing me a free copy of this book in exchange for an honest review. NetGalley in no ways influences my opinion/review of this book. Within the first two chapters of this book, I was hooked. I see so many aspects of my current self in Serena and to see her evolve was comforting, and reassured me that I too can move on. When she’s not shining in the glow of a computer screen, she can be found warming up in the sun after a freezing cold lake swim, chilling with friends at an outdoor music festival, skate skiing on a sunny day, or hik After a couple university degrees and some world travel, Brenda Benny settled down to a life of helping others communicate their stories. One day she decided to start writing her own. That Secret You Keep is her debut novel.